Business confidence in Germany (as measured by the IFO index) fell back in April (reinforcing the impression given by the recent ZEW index reading) as record oil and food prices stoked inflation, weakening further already weak domestic demand, and external conditions - and hence the outlook for exports - continued to deteriorate. The Munich-based Ifo institute said its business climate index, which is based on a survey of 7,000 executives, fell to 102.4 from 104.8 in March. That's its lowest level since January 2006. 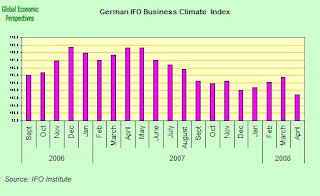 The sub component measuring German executives' assessment of the current business situation declined to 108.4 in April from 111.5 in March, while the indicator measuring expectations for future business dropped to 96.8 from 98.4. Confidence also fell in France, with sentiment the among the 4,000 manufacturers surveyed by Insee, the Paris-based national statistics office, sliding to a 16-month low of 106 from 108. In Italy, consumer confidence also held near its lowest level in four years, the Rome-based Isae Institute said today, while in Belgium, business sentiment dropped to the lowest level in more than two years in April. A sharp slowdown in Europe will damp inflation and force the European Central Bank to cut interest rates within six months, the IMF's European Director, Michael Deppler, said earlier this week. The ECB is reluctant to follow the U.S. Federal Reserve in cutting borrowing costs to bolster the economy, stressing its concern that inflation may get out of hand. Food-price inflation in Europe accelerated to 6.2 percent in March from 5.8 percent in the previous month. That's the highest since the European Union's statistics office, Eurostat, began the current data series in 1997. The prices for rice, soybeans, wheat and corn have all risen to records this year. Crude oil also reached a record of $119.90 a barrel on April 22. At the same time ECB policy makers including Germany's Axel Weber and Juergen Stark have suggested the ECB's current benchmark rate of 4 percent may not be high enough to combat inflation. The April preliminary estimate for the German purchasing managers index for manufacturing came in at 53.6 on Wednesday, significantly below economists' expectations of a 54.8 reading. On the other hand, the services figure surprised on the upside with a figure of 54.6. The consensus had called for a reading of 51.6. In March, the manufacturing and service PMIs came in at 51.8 and 55.1 respectively. The euro zone composite PMI was recorded at 51.9, up from both the previous month’s reading of 51.8 and the expected reading of 51.5, but the eurozone manufacturing sector index, which brings together a number of indicators, dropped sharply, from 52 in March to 50.8. According to a Danske Bank research note, the most conspicuous part of the euro zone PMI manufacturing results was the fall in the new orders index from 50.9 to 48.6, its lowest level in nearly three years. Manufacturing new export orders contracted this month for the first time in almost three years, according to purchasing managers’ indices for the 15-country region. Even Germany, where overseas sales have appeared resilient, saw a sharp slowdown in growth rates. “The effects of the euro are becoming increasingly widespread as long-term supply contracts are renegotiated,” said Chris Williamson at NTC Economics, which releases the figures with the Royal Bank of Scotland. So far, eurozone businesses, especially in Germany, have largely shrugged off the euro’s rise. The results will worry policymakers because the effects of currency appreciation typically take many months to feed through. This week, the euro rose above $1.60 for the first time since its launch almost 10 years ago – suggesting a further slowdown in exports is in the pipeline. France’s new export orders were already below 50 in March, but the latest figures for Germany showed a fall from 54 last month to 51.6 in April. The survey in-cludes trade between eurozone countries, but NTC Economics said responses by companies suggested the euro’s value was becoming increasingly an issue. 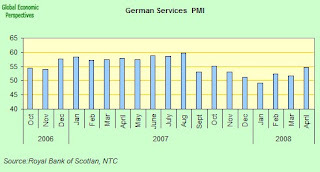 Germany's economy has performed relatively well in recent months. The economic slowdown is most pronounced in Spain and Italy, with France in between. 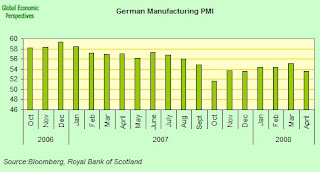 Germany's overall PMI index rose to 55.0 in April from 53.0 in March. But the French composite PMI dropped to its lowest level since November 2004, dipping to 53.9 in April from 55.9 in March. With a stubbornly elevated rate of inflation and a weaker rate of growth, the European Central Bank's policy dilemma is worsening, leaving the central bank's rate-setters with little room to maneuver. The worsening outlook for manufacturing contrasted with bullish euro-zone industrial order inflow reported for February, when bookings rose 0.6% month-on-month and 9.9% year-on-year, according to Eurostat. Italian consumer confidence rose slightly (but ever so slightly, see chart below) in April - holding near its lowest level in almost four years as an economic slowdown prompts households to cut back on spending. The Rome-based Isae Institute's index, based on a survey of 2,000 families, rose to 99.8 from a 99.0 last month. The March reading was the lowest since May 2004. Rising food costs and oil prices near the $120 a barrel mark are stifling consumer spending as wage growth stagnates. Even with economic growth slowing, higher energy and commodity prices have pushed the inflation rate to its highest in at least 11 years, further sapping optimism. 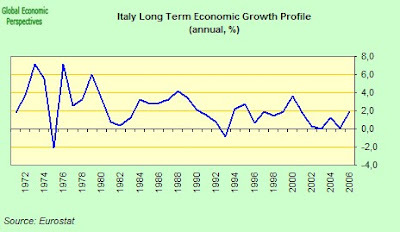 The Italian economy may have already slipped into recession in the first quarter - or even in the last quarter of 2007 . Italy has suffered three recessions between 2001 and 2005. According to the IMF Italy will grow by 0.3 percent this year, half the pace of the U.S. and a fraction of the 1.2 percent growth rate anticipated for the entire euro region. 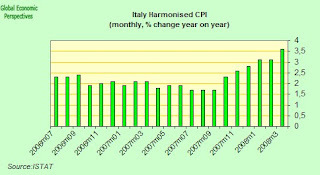 Making this the 12th year in a row that Italian growth has been below the average rate for the euro-region. Italian retail sales fell at the fastest pace in four years in March as campaigning for national elections drew to a close and added to concern about the economic outlook, the Bloomberg purchasing managers index showed. For a much fuller study of the issues which lie behind the present economic malaise in Italy see my full-study "Italy's Economy Going Into The 2008 General Election" post. 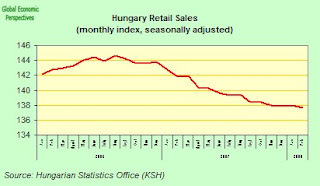 Well there are no real surprises in this months retail sales data since Hungarian retail sales dropped by 0.2% month on month in February, following a 0.1% increase January, according to data adjusted for calendar and seasonal effects from the Central Statistics Office (KSH). I say this is not surprising since there were only two months last year when the KSH reported a month on month rise. At the same time on a working day adjusted basis retail sales fell by 2.5% over February 2007. Sine the annual drop was by 3.0% in January and 4% in December we could say that the rate of decline is now slowing, and that we should expect this situation to continue. If we look at the volume index for industrial sales chart then the position becomes abundantly clear, with sales having peaked in the middle of 2006 and headed steadily down since that point. Combined sales of cars, car parts and fuel (which do not a part of European statistical systems) were up, and totalled HUF 163.24 billion in Feb, or an annual rise of 2.6% which compares with a 1.4% fall in January. Really as I say, I don't think we should expect this situation to change anytime soon, and I hold this view because of the appreciation I have of Hungary's internal consumption dynamics, an appreciation which I would say basically sets me apart from the other analysts working the Hungarian economy. Hungary's domestic consumption as can be seen from the chart below actually peaked in 2002., and since 2004 it has not be especially strong. It is now in full retreat. Would anyone like to tell me when it will recover, and by how much? I certainly can't tell you, but I certainly strongly doubt we will ever see the 2002 level again, and I am even rather unconvinced we will get back to the 2005 level. My intuition is that Hungary will now become an export driven economy. Basically I the reasons I hold to my view are based on the differences I have in my appreciation of what the whole idea of "convergence" means in an East European context, and I hold to my view due to the special importance I attribute to demographic factors in the economic growth process. 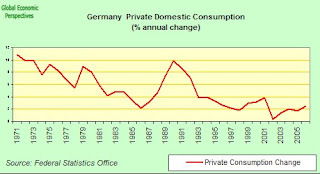 In order to illustrate what I mean I would like to close this post by taking a quick look at historical German private consumption data. One of the core arguments I am presenting on this blog is the idea that part of the issue facing East European economies like the Hungarian one is the population ageing situation. This argument is being by and large ignored by mainstream analysts, but simply ignoring a problem doesn't make it go away. 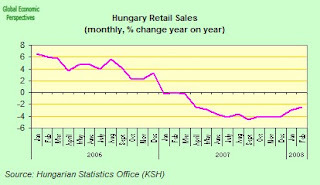 Most analysts, as I have been arguing, tend to look at what is happening in Hungary on a "convergence" cyclical basis. But there are reasons for thinking that this view may be inadequate. Hungary's economy grew for ten years up to 2005, and then the growth process started to grind to a halt. Indeed you could argue that the whole wasy that the fiscal deficit got so out of hand in Hungary was a result of the slowdown in domestic consumtion and economic growth. Now Germany also had a very significant consumer boom and correction back in 1995, and if you look at the chart below German domestic consumption has never recovered. 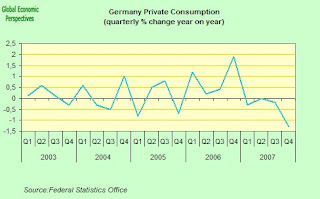 And indeed if we look at the next chart we will see that in 2007 (following the significant VAT rise induced local spike in the 4th quarter of 2006) German private consumption has been steadily declining across 2007, and this despite a very rapid rate of new job creation and a substantial drop in unemployment. I think people should at least think about this carefully, and ask themselves whether or not Hungary may now follow this course, becoming an export driven economy. At least, I would argue, there are prima facie reasons for considering this outcome to be a real and present possibility.